The purpose of this project is to wrestle with multiple design and engineering issues to discover the best collaborative solution. Make a set of cad floor plans and a cross section (optional) that meet all of the criteria. Plan needs to be functional and provide flexibility to live well. Keep project within budget guidelines (calculate square footage of first and second floors, decks, and car storage. Create a structure that is safe. You will need to meet current energy standards. You will need a sketch up model of the project. You will present the Completed Project to the class with appropriate support documents. You are working with a team of two or, possibly, 3 members. A bath on each floor, a functional kitchen, a wood stove, a great room, two bedrooms with closets and a hobby room with good light and storage. You will have to place some rooms on the first floor and some rooms on the second. Also, a carport is strongly desired. Start with a simple bubble chart on a blank piece of paper. Write down what direction is South (for potential solar gain), which direction is view (To group view priority rooms toward the vistas), and indicate from what direction to access the property (driveway). If there is a steep slope, indicate that. Then draw circles (bubbles), move them around, and label them. The bubbles are sized to match the space allocated for the rooms. Then make a pencil sketch of the rooms. Take gridded paper and start a sketch. This shows room sizes and their inter relationships. Only then go to the computer and begin fitting the rooms together in Auto Cad. Part 1: Concept sketche(s) costed out. These are hand drawn. They can be quickly developed, but they need to reflect quality thought. Calculate area and square footage costs to stay on budget. Part 2: Preliminary cad drawings of the first and second story floor plans. These will show exterior walls (2x6 probably), interior walls (2x4 probably), closets, bath fixtures, kitchen cabinet and applicance layout, all windows and doors with sizes shown, wood stove location, stairway, and total square footage noted. Part 3: Revised floor plans and a cross section done in Auto Cad. Floor Plans plotted at 1/8" = 1'. Plans include room names and sizes, window and door sizes, all door swings shown, all appliances shown, including hot water tank. Drawing must be dimensioned. Cross section is plotted at either 3/8" = 1' or 1/2" = 1'. The parts of the cross section are labeled. Section should indicate siding, sheathing, stud thicknes, insulation thickness, interior sheathing, Footing sizes, rebar, treated sills, Support beams and proper bearing footings, floor joist sizes, insulation under house, roof rafters, roof pitch, roof sheathing, roofing material. Code required smoke detectors also need to be located. Your project also has to meet current energy minimums for the state of Washington. 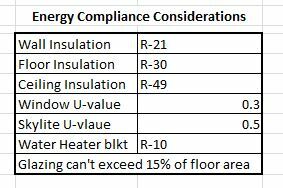 Window area can't exceed 15% of your total heated floor area. So if you have 1600 SF of floor area, window area can't be more than 240 sf. 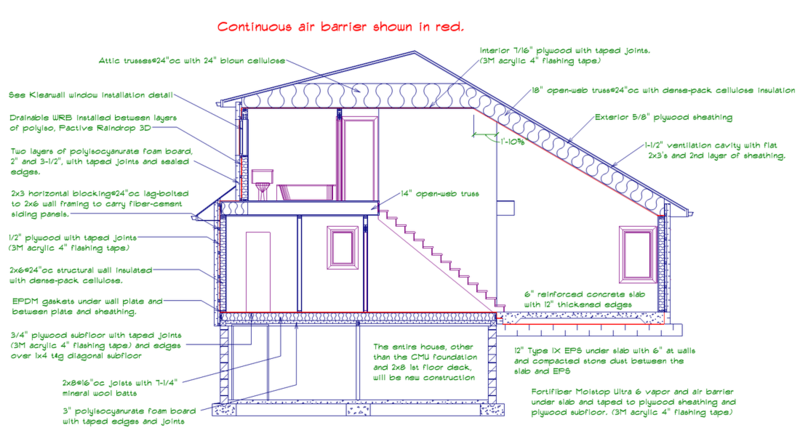 On your cross section drawings indicate the R rating of exterior wall insulation, floor joist insulation over crawl spaces and roof insulation. The above chart shows state minimums. This is a to scale model with rooms and materials applied to all surfaces. Part 6: Class Presentation and Critique. Roof rafters here are 2x12 and cannot exceed 20’ in length. You will have to support any rafter spans with a support beam if you exceed 20’. The sketch above shows a heavy roof load and no real support for it. This house could not support the roof with or without snow. How would you support the load of the roof? Can you trace how that load transfers down to the earth? Why would the house above as drawn fail? How would you prevent failure? 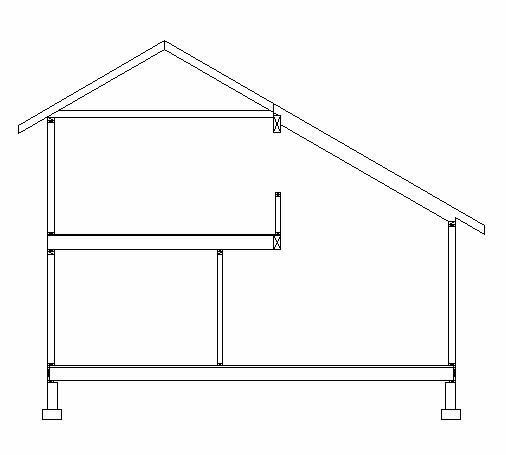 Every saltbox I've built (3) had a 7 in 12 roof pitch. What that means is that the roof rises seven inches vertically when your move 12 inches horizontally. So on the above cross section Draw a line horizontally for 12 inches from A to B. 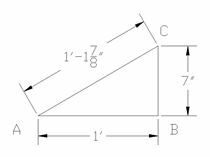 At B draw straight up 7 inches to C. The hypotenous is the distance B to C. And that line (hypotenous) represents the pitch of the rafter. We do not want the building to fall down. We will calculate roof and floor loads. Begin by understand that you do not want rafters to exceed 20', that floor Joists should probably not exceed 10' in length, that 6x12 Beams should probably not exceed 20' in length. In class we will learn how to do the calculations and apply them to your building to make sure it is safe. If you exceed safe loads, we will have to deny your building permit. To begin, you will be required to explain to me how your roof loads will transfer down through the building. Look at the cross section of the salt box above and be sure you understand the physics of the forces. The ground holds up the roof. The building attaches to the ground with gravity and the connection is with a concrete footing, normally. 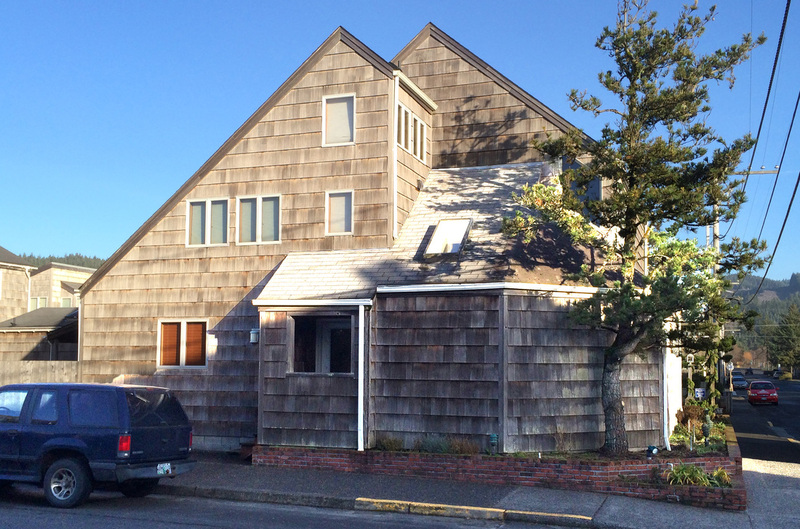 Your saltbox has two stories so in Pierce County you would be required to have a footing that is 15" wide and 7 or 8 inches tall with normally two pieces of 1/2" rebar to keep it together during ground swell or earthquake. The square inch footprint of the footing and of support piers is the bearing surface of the building. All of the weight of the building is held up by the ground under that bearing surface.